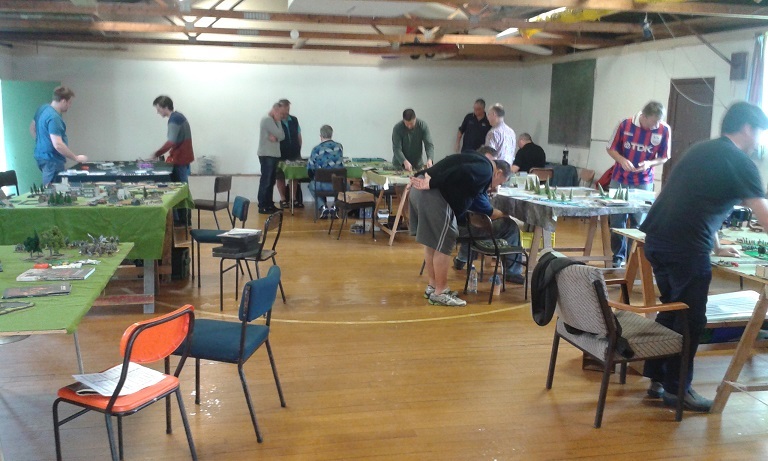 Another bustling day at the club today with heaps of games happening! Al and Kit continued their WWII game from the previous meeting, carrying on from where they left off last time. In FOG-N, Andrew's Mixed nationality corps beat Philip's British in the Eylau scenario. There were four Flames of War games between John (British), Lee (Germans), Ray (Germans) and Steve (Russians). Even more Kings of War games - Grant (Dwarves) v (Elves), Rob (Dwarves) v Alan (Goblins), Brett (Elves) v Kendall (Ogres), Alan (Goblins) v Philip (Kingdoms of Men), Brett (Elves) v Steve (Varangur), and Rob (Dwarves) v Kendall (Ogres). We had some interesting games at the club today. 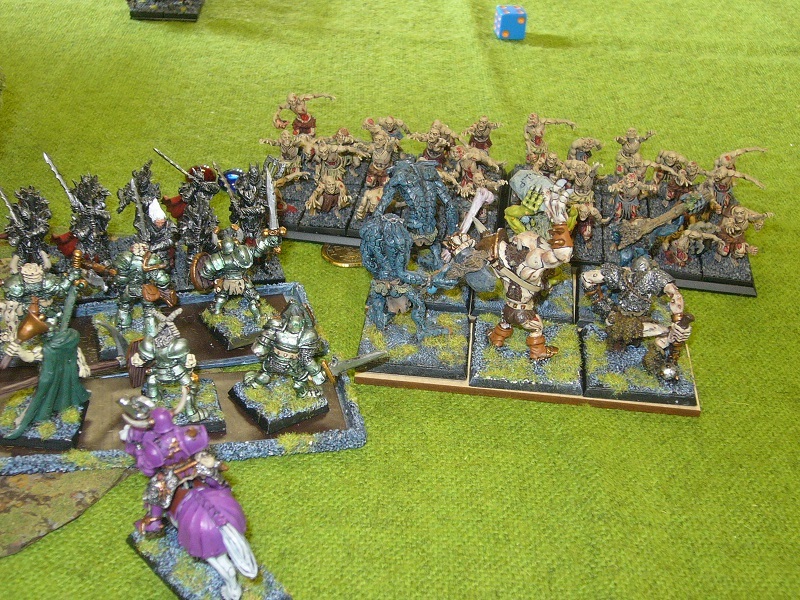 Steve's most recent acquistion, a Chaos army bought at NICon, had its first game (and a successful one too!). 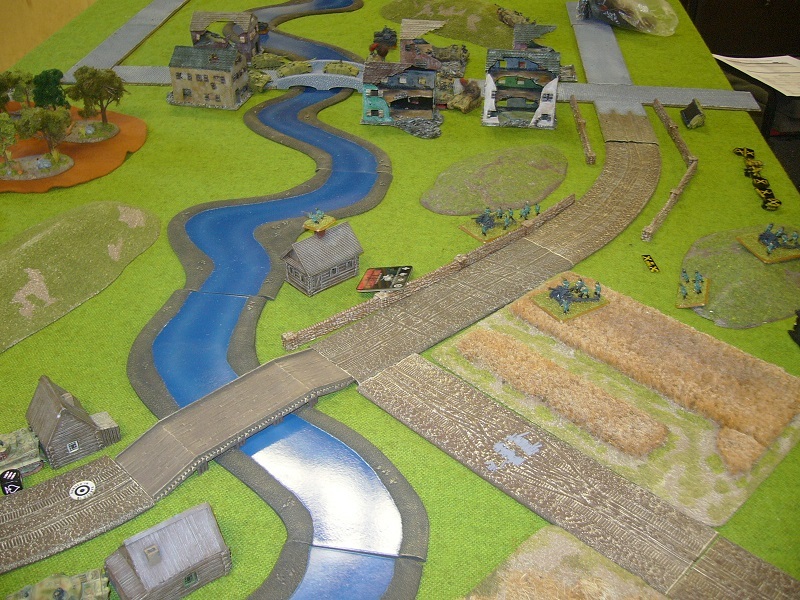 Al and Kit had a 15mm WWII game using a modified set of WRG WWII rules. There was some pretty impressive terrain on display too. 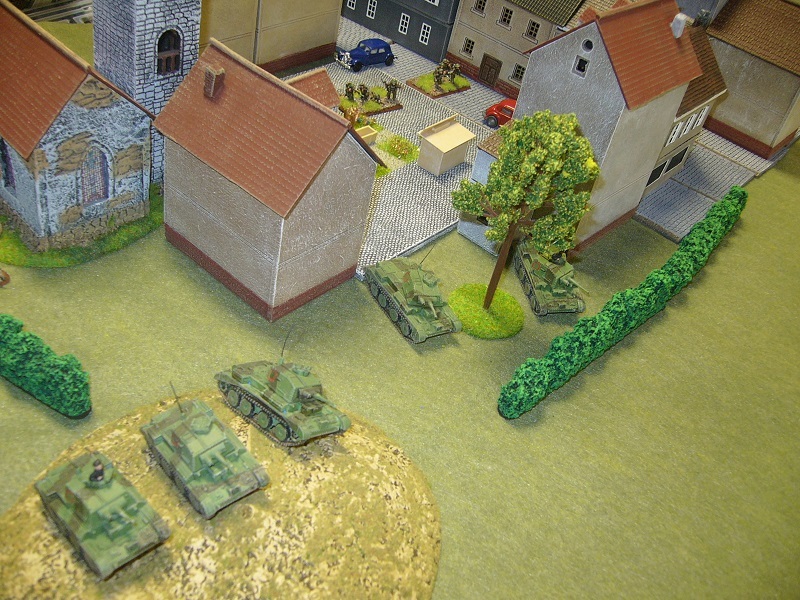 There were also a couple of Flames of War games - Ray's Brits taking on Steve's Germans, and John's German armour attacking Rob's Polish Home Army. Kendall (Brotherhood) played Rob (Brotherhood). That doesn't sound very brotherly, does it? This year's North Island convention was in Hamilton. Rob and Mike played in the Flames of War competition, winning First and Third places. In FOG Napoleonics, our club had 7 out of the 10 players and took out the top three places - Kit 1st, Brett 2nd and Andrew 3rd. The French army attacks the Tyrolean rebels defending their hills. Next year's NICon will be held in Auckland. With NICon coming up next week, we had a few practice games. And several more Kings of War games as well. Flames of War. Steve and Andrew had a late war game, Germans v Germans. Kings of War. Alan (Forces of Nature) played Rob (Dwarves) in two games. There waa another Halo spacefleets game. Or were there two games? Irregular Warfare - 16th Century colonial wargame. Grant and John had a couple of games with Conquistadors and Aztecs. Flames of War: Rob (Polish Home Army) vs Ray (German SS Panzer Kompanie). 4-3 win to Ray. Rob (British Infantry Company) vs John (German Panzer Kompanie). 5-2 win to Rob. Kings of War. David from Mighty Ape visited us to play a couple of Kings of War games. His Ogre army beat Philip (Kingdoms of Men) and then Rob (Abyssal Dwarves). In other games, Rob played Brett (Elves) and Brett played Philip. A couple of new players came to the club today playing Halo Fleet Battles. One FOGN game today, Andrew (1813 Russians) v Kendall (1815 Prussians). There were also a couple of Kings of War games - Kit's Orcs v Brett's Elves, and Rob's Forces of Nature v Philip's Kingdoms of Men. 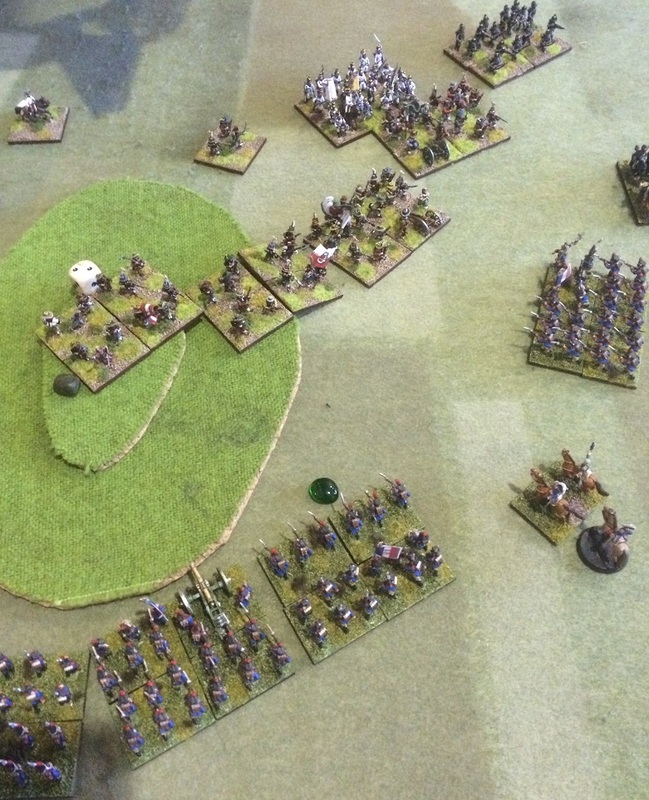 No club meeting this weekend, but instead we had a FOG-Napoleonics tournament. Kit took 1st place. Lots of Kings of War at the club today. Alan (Undead) played Brett (Elves). Brett (Elves) played Rob (The Herd). Philip (Kingdoms of Men) played Rob (The Herd). Kit (Orcs) played Philip (Kingdoms of Men). FOG-N. Kendall (Anglo-Russians) played Mike (1813 French). Kings of War. Alan (Undead) beat Rob (The Herd), and then Alan beat Philip (Forces of Nature). DBMM 15mm. Steve's Late Romans beat Philip's Mithridatics in a 500 point game. Blucher. Brett (Austrians) played Kendall (Prussians), but the game was abandoned as being boring. FOG-N. Mike H (British) beat Mike G (French). Our club got a good haul of trophies at Battlecry, taking out all the places in Napoleonics (because we made up all of the competition), 2nd and 3rd in Kings of War, and 3rd in Flames of War. With Battlecry coming up, there were several FOG-N training games. Kendall's 1815 Prussians beat Brett's 1795 French in the Quatre Bras scenario. Mike's 1814 French beat Philip's 1815 British at Teugen-Hausen. Andrew's Prussians beat Stu's Russians as Friedland. In a standard non-scenario game, Al's Anglo-Spanish played Brent's Prussians. AGM - the Council is Steve (Pres), Kendall (Sec) and Kit (Treas). Fees set at $60. Kings of War - Philip (Forces of Nature) beat Alan (Brotherhood) in the Dominate scenario. Rob (The Herd) then beat Philip (Nature) with a remarkable 2000 to nil score. Field of Glory Napoleonics - Brett (1795 French) and Mike (1813 French) played the Teugen-Hausen scenario twice, each taking a turn as attacker and defender. There were three Flames of War games, early war to get some Battlecry practice. Lee (Finns) beat Steve (French). Kit (Germans) beat Lee (Finns). Steve (French) beat Kit (Germans). Rob and Scott had a Bolt Action game, both using British armies. Kings of War - Rob and Alan had a couple of quick KOW games. Field of Glory Napoleonics - Brett and Kit played a scenario game, trying our some new things for Battlecry. There was a multi-player game between Al and Philip (1815 Anglo-Netherlands) and Kendall and Lawrence (1812 Russians), with 2000 points a side.